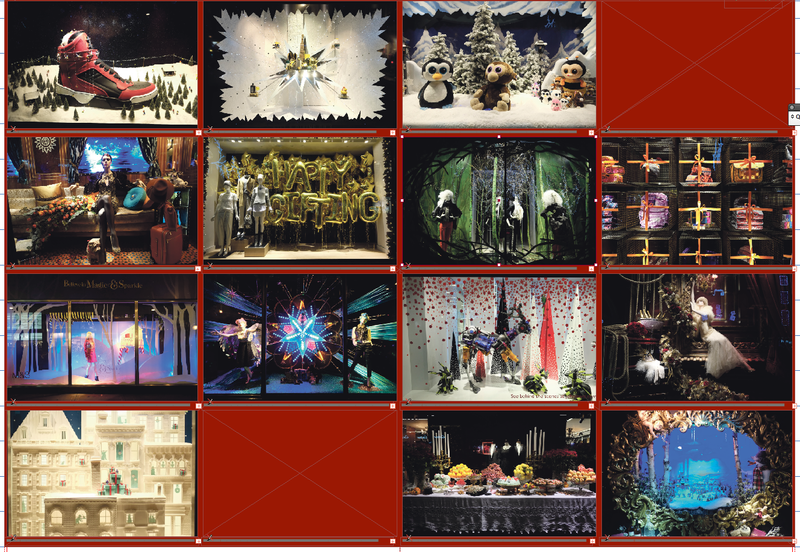 The whole centrespread is being given over to the Christmas displays in London’s biggest shops – Harrods, Harvey Nicks, Selfridges etc – as painstakingly shot by our photographer and set against a festive red background. The designer’s almost finished: a couple of pictures left to insert. It looks lovely. That’s not quite the problem here: here the problem is that there are 16 captions on the same page, all with the same news angle. 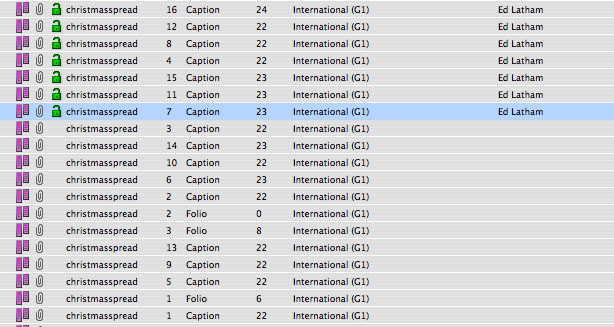 The first caption is easy: it’s the next 15 that are the problem. This is going to test powers of variation to the utmost. How many synonyms can you think of for “window display”? Not 16, right? Nor me. You know you’re in trouble when you’re checking in the style guide to see whether “tableau” takes an “s” or an “x” in the plural. Deadline adrenaline got the job done, as always. A little description, a dim awareness of the TV ad campaigns on which some the displays were based, and judicious reference to a similar gallery on the Harper’s Bazaar website whose creators had a much more acute grasp of the concepts than I did, and we were there. It wasn’t pretty, but at least it wasn’t dummy text. In a job where the major requirement is cutting, it’s surprising how often you find yourself needing to fill. After that, anyone would need a break. So Ten Minutes Past Deadline is going on its inaugural Christmas holiday, to return in the new year with a fresh determination to seek out error and a renewed horror of periphrasis. Until then, may you have a beneficent festivaltide, and all felicitations for the twelvemonth in prospect. Happy Christmas, everyone. I know what you’re thinking: what are the other four types of water? If you substitute the other isotopes of hydrogen, I suppose, there’s heavy water (with deuterium), and tritiated water (highly radioactive, with tritium). Seawater, as opposed to fresh water, for a fourth? Maybe. And then, er, chicken. We talked last week about how leaving out the “little words” – articles and forms of the verb “to be” – can cause infelicities in headlines. But even putting back “is” in this one doesn’t solve the problem; whichever way you read it, you’re inserting “is” as the verb after “chicken”. The problem is with “a fifth”. And it’s a problem I suspect that only British editors have. You’d think that loosey-goosey, demotic American English would be less precise than uptight, colonial British English about fractions, but I’ve always found it to be the other way round. Saying “one-fifth” for a written-out fraction, as explicitly called for in Chicago style and implicitly in AP, is understood on both sides of the Atlantic, but over here, what you might call “colloquial fractions” with an indefinite article – a fifth, a quarter, a third – are far more common in everyday use. No doubt this usage may have crept overseas as well, but I can’t ever recall a US speaker in a formal setting using “a” to form a fraction. Certainly President Obama and Al Michaels – the two modern pinnacles of American diction – never seem to do it. And of all the things a US citizen could say to sound alien in Britain – gasoline, spackle, jump rope – nothing marks you out as a visitor any more clearly than the painstakingly accurate “one-half of one per cent”. Half a per cent, we’d say. But of course “a” + an ordinal number means something else as well: a third republic, a fourth symphony, a fifth water. So we need to be a bit careful. It wouldn’t hurt us to sound a little American at times, and go for “one-” when there’s space. 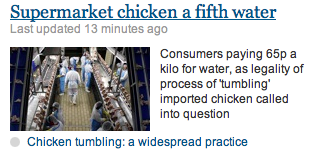 And if there isn’t, why not just “Supermarket chicken 20% water”? * The article says that consumers are paying about 65p a kilo for water. That sounds about right: a kilo of water is the same as a litre (very well thought out, the metric system), and 65p is about what you pay for a 1l bottle of own-label springwater. That wouldn’t have “additives” in it, though, of course. And anyway, you wanted chicken. There aren’t many hard-and-fast rules about writing headlines. All the basic ones – use a verb, fill the space, avoid bad breaks, don’t repeat the opening sentence – are fine, but they only get you so far. Specifically, they only get you as far as writing a headline for a simple news story; they fall a long way short when it comes to features. So if you find yourself with the job of turning a prosaic feature hed into poetry, where do you start? Well, potentially almost anywhere. But if there’s one thing that can kill a sparkling phrase stone dead, it’s the blanket training-course advice always to leave out articles (a, an, the) and forms of the verb “to be” (is, are, was, were) from headlines. Those two conventions alone are largely responsible for creating the distinctive “sound” of news (NIXON IN CHINA; SMOKE SEEN OVER VATICAN). Indeed, they create such an urgent, no-time-to-waste tone that they are actually desirable for breaking stories. But if you follow them to the letter, they ruin the rhythm and flow of almost everything else (PARTING SUCH SWEET SORROW; WOODS DECAY, FALL; SINGLE MAN IN POSSESSION OF FORTUNE ‘IN WANT OF WIFE’ – SOURCES). That means that if the articles and verbs make your feature headline too long, you don’t omit them – you abandon the whole headline. You start from scratch. You think of something else that will fit, with all its articles and supporting verbs, and use that instead. Whatever rhythm your original idea had will be lost the moment you leave out even a short word, because you’re leaving out a beat. That’s why it won’t “sing”. That, more often than you’d think, is where the magic disappears. Let’s say that you’ve got a light-relief picture feature about a pop star misbehaving at an aquarium in Monaco, and you’ve decided to go for the obvious gag. When you write the headline, it has to be THE MAN WHO BROKE THE TANK AT MONTE CARLO, not MAN WHO BROKE TANK AT MONTE. The full-length original is, near as dammit, iambic pentameter. The shortened one – well, it isn’t anything at all. And if you’re alluding to a well-known phrase, or just subverting a cliche for comic effect, every word you miss out makes it harder for the audience to work out what you’re doing. So that’s kept (“The Communist”), dropped (“Maoist sect leader”), dropped (“collective”), kept (“a cult”), dropped (“home”), dropped (“woman captive”), dropped (“window fall”). Associated Newspapers law unto self. But I still think it’s a rule worth sticking to whenever the difficult issue of “tone” gets raised by the higher-ups. It doesn’t solve every problem, but it starts you down the right track. Little things mean lot.